Instead of an SSD drive... it's a fairly big price difference, granted, I know the 'you get what you pay for' but this seems like a decent way to go ? It's not as fast as my crucial but close...If DCS keeps expanding on my crucial I'll move box over to it. I was thinking I needed a 1TB drive to replace my current one, but I see I have actually only used 317GB - so a 500GB SSD drive is like half the cost. I plan on keeping my 1TB drive for extra storage, but moving it's contents to the SSD drive. BTW, any recommendations on software for that - I don't want to reinstall the OS etc... ? I wouldn't move everything over or your 500gb SSD will be filled to less than 200 gigs ....If you start getting more DCS modules and maps as well as BoX games that could fill up fast .....I'm already thinking about moving IL2 over to my second SSD to keep it off the DCS drive. My crucial drive came with Acronis so that's what I used..I would get that it's only a few more bucks..I also used it to format the other SSD when I got it ....I'm sure there must be freeware out there somewhere ...don''t know. I went with the Crucial. That 370 GB includes quite a few movies I plan on moving to the spindle drive. I have a 1 TB Mushkin in my current computer. It is the third Mushkin I have had. They have good price and good reviews. This has pretty good specs and starts DCS in a flash (no pun). Do yourself a favor and buy Acronis or some other cloning software and a HD cradle to make the clone. Swap the drives and you are on the road in no time. so my story on SSD is my previous computer i used had a 256 GB SSD (OS), 512 GB SSD data, and 1 TB SSD data drive in it. i used acronis when i decided on the new computer to do a full backup to my network. my new computer came with a 1 TB mechanical drive. cloned the mechanical to the SSD and voila. (takes a couple hours) i tested speed before and after and the difference is impressive. it literally take less that 30 seconds to load DCS and then maybe another 30 to load a mission. you will not be sorry. if you need help during your process i will be happy to assist. It's amazing... So much better, it was hard to load anything especially since for work I use a MacBook with SSD. I was able to get acronis for crucible for free. That was painless although I had to clear up space. I ended up removing Clod, just seems no one is playing it online when I hop on. I need to reformat and do a fresh OS install sometime but meanwhile enjoying the perf update - plus my 2x8 memory is on the way! the Crucible software is nice too - helped for optimization. @recon. interesting. i did not even think about that. since my computer came originally with a standard SATA the AHCI is not set. but question. 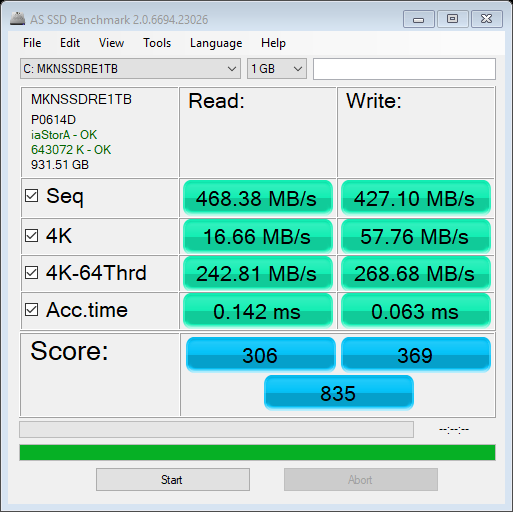 what sort of result did you get in the benchmark software AS SSD? in the link you posted had before and after and my before scores crushed even his after results.